Identify eligible grant opportunities and prepare applications for funding. 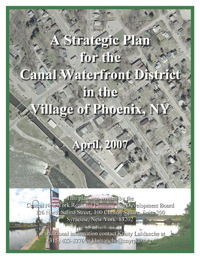 In June of 2006, the Central New York Regional Planning and Development Board was selected by the Village to serve as consultants to the project. The following is a description of the Board’s tasks for fulfilling achieving the objectives of the Small Cities grant. Develop a roadmap for implementation of the strategic plan and identify the elements, long and short term, which constitute the specific activities that need to take place to fulfill the goals of the plan. For additional information on the Village of Phoenix Strategic Plan process, contact Jeanie Gleisner at jgleisner@cnyrpdb.org or (315) 422-8276, ext. 212.